Romana Kassam is a self-taught artist and storyteller, creating visual art, installations and sound and light experiences. Her vision is to showcase perspectives and occurrences as a woman of colour, while empowering others to both recognize the importance of representation and invest in sharing stories perhaps previously unheard, or unseen. Originally from Markham, Ont. and having moved to Toronto in 2010, Romana says she finds inspiration by attending other artists’ shows and observing how they may be channeling their talents, along with experiencing the stories they are choosing to tell. We connect with Romana to learn more about her journey to embracing her identity as an artist of colour, as well as her ongoing efforts to connect with her South Asian ancestors and history. 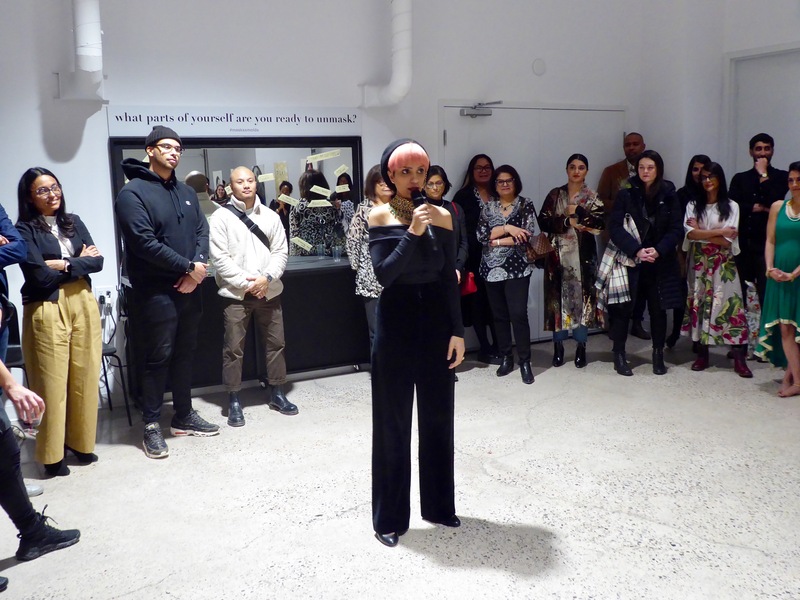 Guests gather at Romana Kassam’s first solo exhibition, MasksxMolds, looking at answers to the posed question, “What parts of yourself are you ready to unmask?” Photo by: Nabeel Pervaiz. 1. From where does your interest in creating art and using multimedia stem? I did not realize this before, but creation has always been how I heal myself. It is a form of release and is probably the most authentic expression. I believe it is my responsibility to keep creating, not only for my own growth and personal expression, but also to give others permission to do the same. Everything I create, and all of the ways I express myself, is an extension of that. 2. What methods did you tap into when teaching yourself to produce art? How do you ensure your artistic education remains ongoing? Before this was my profession, I was always looking for excuses to create. A friend’s birthday, someone’s baby shower – I was constantly challenging myself to try and make new things. I did not realize it at the time, but that was how I kept my creative juices flowing. Sometimes, they can run dry when you are at a 9-5 job that you don’t really feel passionate about. Today I invest in myself, my well-being, my spirituality and my craft because my entire being needs to be nurtured in order to create. 3. Might you recall the first piece of artwork you created/story you told? What was it? How did creating this initial piece make you feel? I don’t have vivid memory of this, but I have been told this story by my parents a few times. When I was four-years-old in Junior Kindergarten, I painted a picture of a little girl with pigtails holding an apple basket in the centre of the page. On the border of the painting, I drew 22 apples which represented the number of students there were in my class. My teacher, Mrs. Lee, was so impressed, she called my parents in to look at it. This painting was also hung up right outside the office at the entrance of the school. I would like to think my skill has developed a bit over the last 30 years. I still, however, express what I see in the way I see it. 4. Why is highlighting your experiences as a woman of colour so significant? In December of 2018, I went to Miami Art Basel, which is one the largest art fairs in the world. I attended several of the different conventions while I was out there. There were artists from over 33 countries showcasing their work, but none of them looked like me. There was actually no representation from the entire Asian continent, it seemed. A very disappointing reality for a world fair. What I realized during my time at Art Basel was the commercial art space is dominated by predominantly euro-centric narratives and those stories are getting old. I want the stories of me and my people to be told and expressed, because our experiences are important too. I am passionate about taking up space in the commercial art world because I want people who look like me to feel like they can own fine art that speaks to them and their experiences, too. 5. What do you hope artists and audiences alike learn about representation, diversity and inclusion via the work you create? I want marginalized people, specifically people of South Asian descent, to feel seen and heard, and feel empowered to fill historically white spaces with our truest colours. 6. What feedback have you received about your art? What are some ways you work to manage suggestions, criticism and praise? Being an artist is already super vulnerable. You are literally sharing with the world your deepest thoughts and emotions – it’s almost like you are walking around with an open wound. It definitely takes time and practice to develop the skin that you need to manage the energy that comes your way, whether it is good, bad or neutral. The key for me has been getting clarity around my purpose for creating and remaining grounded in that, always. 7. Have you always identified with the term, “artist?” Before your journey as a creator, what projects and/or career path had you pursued? Taking on this title was definitely not easy for me, at first, but now, I could not imagine being called anything else. When I first quit my corporate job and started a creative business as a mehndi (henna) artist, I would always say that I was an entrepreneur. It wasn’t until I moved onto murals and installations and started getting paid by larger corporations to create did I start identifying as an artist. 8. What advice, or commentary, did you receive when you decided to create and curate art, full-time? The reaction that I got from my immediate family at the time was filled with concern and pessimism. Being born to immigrant parents who come from a survival mindset, the idea of making money for yourself by creating art was too far-fetched and unfamiliar to comprehend at the time. Since I quit my job and have proved that making art for a living can be profitable, my parents are nothing but supportive. My community and friends were highly supportive from the moment I decided to create full-time and continue to be to this day. 9. What piece of advice, or commentary, was extremely unhelpful? Why did you decide to ignore this (unwarranted) perspective? I was told to not make art a full-time job and to just pursue it as a side hustle. I didn’t take that advice and I am glad. It is almost impossible to be an artist and only give a fraction of your energy to your work. 10. Who or what has been your biggest support since your journey as a full-time creator, began? I would say my partner and my community, and both for the same reason. Every time I come up with a new idea, these amazing people are always around to help me figure out how to bring it to life. Romana Kassam stands in front of an art piece she made, displayed at her first solo exhibition, MasksxMolds. Photo by: Alim Alarakhia. 11. What is a skill you’ve had to develop and/or enhance to ensure you’re striving to meet your professional goals and aspirations, as a self-employed artists and leader? I think when you are a creative, it can be challenging to also be good at planning. Being an artist and entrepreneur has forced me to get better at managing my time. It is definitely something that I am working on daily. My latest hack is scheduling every little thing into my calendar, including small tasks and errands. 12. What have been the most significant lessons you’ve learned about managing time and stress? Practicing self-care rituals frequently, like taking baths and smoking CBD, keeps me pretty calm. I just increase as needed during high pressure times, like the week before a show or a couple nights before a big deadline. As for time, I just have to make sure I diarize everything. In the future, I imagine hiring a manager so that I am not having to take care of the art and the business at the same time. 13. There are many highs and lows of the creative process – how do you manage the ever-changing flux of inspiration, productivity and audience engagement? How do you ensure you’re factoring in time to take breaks and re-focus? I ride the tide when it’s high and try to keep momentum going for as long as possible. I also give myself permission to retreat when my body feels low energy. You cannot force yourself to produce if your energy levels are zapped. I also trust the creative process and know that after every expansion there is a contraction – it’s just growth. 14. What steps do you take to ensure your artwork portrays your traditions, cultures and family experiences? I try to be as tuned in as possible to what is happening in my communities around the world, but I am mostly trying to tune into myself. I know the stories of my ancestors lives in my bones, I just have to go a little deeper to uncover it. 15. Has this process always been a positive one? Describe your relationship with understanding and appreciating your identity (if you are comfortable). I very recently started to acknowledge who I am and where I come from. I have had to unlearn a lot to create room for new understandings of my identity, mostly around the religious community I belong to (I am Ismaili), but I would say that overall, it has been worth it and I am constantly surprised and grateful to be born into such an amazing community. 16. What advice do you have for other creators developing an understanding of their identity and the relationship between who they are, where they’re from and where they now live? When I came into awareness around this feeling of not knowing who I was and where I belong, I went back to where my initial ideas of identity were formed. For me, that was back to my community. I am still evolving every day, but I am definitely a lot clearer on who I am now, more than I ever was. 17. From January 25 to 27, 2019, you hosted your first solo exhibition, called MasksxMolds, at Toronto’s Neighbourhood Studios. What did it feel like to plan, produce and complete your first exhibition? It was such a dream come true. It felt like everything I had ever learnt in my life was leading up to that moment. It wasn’t stressful and was everything I hoped it would be. A few people asked me how I was able to remain grounded during the show and what I realized is: I was not doing anything I was not ready for, I was just doing me. 18. What were your favourite parts of the exhibition? The content of the show – the parts of ourselves that we mask in order to fit into mainstream culture sparked a lot of poignant conversations across generations. My favourite part of the entire experience was being able to actually hear from people about how the visual work and the audio piece resonated with them; how it helped people heal from their own personal experiences and made people feel proud and seen. 19. With whom did you collaborate to make MasksxMolds happen? MasksxMolds would not be possible without my best friend Faramarz Hashemi, who was the producer of the show. He also took care of all the marketing. Elle Alconcel was the curator for the show and also introduced us to Neighbourhood Studios. 20. Do you foresee an opportunity to conduct a second solo exhibition in Toronto? Perhaps elsewhere in Canada? I do not see myself doing another solo for at least another year. I am definitely considering creating a body of work that I can travel with, but I have not given much thought to where that would be. 21. What inspires you to create content, as well as platforms, for people to consume and develop diverse stories in safe spaces? I feel that as an artist of colour, it is my responsibility to channel my talents into consumable messages for my people to relate to. I think it is what my ancestors would’ve wanted. 22. Who are a few creators you’ve been following over recent months? Why does their work appeal to you? I love the work of Bryan Espiritu right now. He is literally creating something new every day and sharing it on his Instagram. It is inspiring to witness and has definitely kept me going at times. The audience at Romana Kassam’s MasksxMolds exhibiition are seated during a presentation. Romana’s works are hung in a gallery throughout the room, alongside a print that reads, “What’s masking you?” Photo by: Nabeel Pervaiz. Romana, thank you for sharing your story, lessons and experiences with us! Readers, follow along on Instagram via @romanakassam, where everything lives. The feature photo is by Rejana Hirjee.